This is something that most certainly goes without saying, but we're going to reiterate it anyways: the Donald Trump presidential campaign has become one of the most insane things in American politics today. Between weird racial outbursts and violence at his rallies, even our allies, such as the UK, have considered banning him from entering their country – which could make diplomatic relations somewhat challenging. Somehow, the billionaire’s zany antics have resonated with an incredibly large section of the population, and it’s looking more and more likely that Donald Trump will in fact be the GOP candidate once the votes are in on the primaries. However, despite all of the offensive, deranged things that Donald Trump has been known to spout, the craziness he incites in others often takes the cake. Over the course of the last few months, his supporters have proven themselves to be some of the most cray-cray voters in the political world. With that in mind, we have compiled a list of the batshit craziest things that Donald Trump supporters have done lately. Some of these people have said totally ludicrous things, while others have done insane things in the name of Donald Trump. Vote up the craziest things that Trump supporters have done below, and be sure to let us know what you think in the comment section. During a Trump rally in Birmingham, Alabama, Black Lives Matter protester Mercucio Southall Jr. was attacked by a mob of Trump supporters. Chanting "all lives matter!" in addition to numerous racial slurs, Trump's supporters punched, kicked, and choked Southall until security forcefully removed him from the premises. Following the incident, Trump himself commented that Southall may have deserved what he got. A Trump supporter in Richmond, Virginia got into a heated verbal argument with a protester at a Trump rally back in October. As the argument escalated, the Trump supporter spat in the protester's face, and began screaming obscenities at them. The protesters were eventually removed from the area. If nothing else, this shows just how far removed from civil discourse Trump supporters have become. They are just as prone to fits of aggression as any violent protestors. A New Hampshire focus group revealed that many Trump supporters believe that aside from the fact that he has an immense fortune, he is incredibly similar to the people who support him. The problem with this sort of assertion is that it discounts the world Trump comes from. Donald Trump was born into wealth with a silver spoon in his mouth. He has always been upper class, and doesn't speak for the working class of America. It just goes to show how uninformed certain people can be about their candidates. 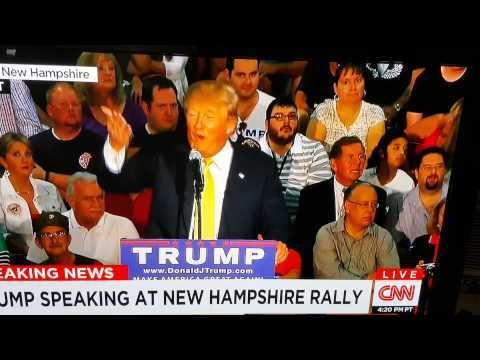 They've Called Muslims a "National Problem"
During a rally last year, Donald Trump decided to open up the floor in order to take questions from his supporters. One man rose from the crowd and declared Muslims to be one one of the biggest problems faced by this country today. He then went on to call Barack Obama a Muslim terrorist, and demanded to know when we could "get rid of them." Rather than admonish the man for his remarks, Trump decided to politely skirt the question and move on to someone else. These sorts of allegations against President Obama - and Muslims in general - have done nothing but increase an ethnic and racial divide in the United States.